Fancy a diamond-studded pen for your next big meeting? 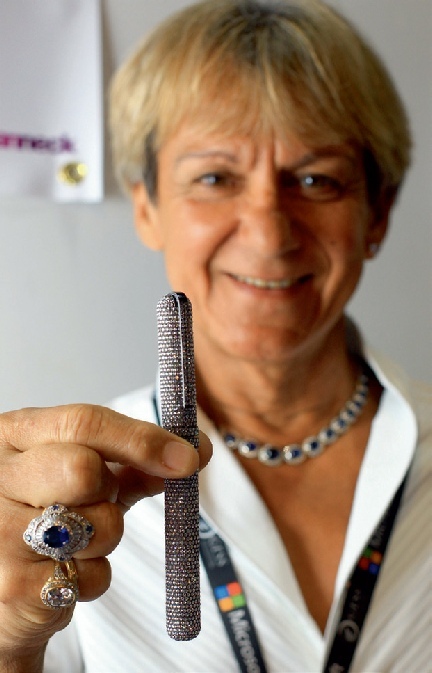 British designer Ian Towning has brought to Dubai a one-off diamond pen worth Dh452,000 (£75,000). Showcased at the Global Education Supplies and Solutions (GESS) in Dubai, the hand-crafted pen took five months to complete. Studded with South African diamonds, the pen also uses 18-karat gold for a truly exclusive finish. “All the designs are unique and all my creations are one-off. These are wonderful creations and it shows how an ordinary object can be converted into something beautiful — in fact, it becomes a work of art,” said Towning in an interview with Khaleej Times. Towning who is also a well-known antique expert from London has designed a variation of the same pen with rubies and diamonds. Teachers and students visiting the show flocked to the pen stand to catch a glimpse of the wonderful item.